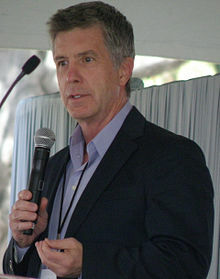 Tom Bergeron (born May 6, 1955) is an American television personality and game show host who is best known as the host of America's Funniest Home Videos and the host of Dancing with the Stars. He has won two Emmy Awards in 2000 and in 2012. Bergeron was born on May 6, 1955 in Haverhill, Massachusetts. Bergeron has been married to Lois Bergeron since 1982. They have two daughters. This page was last changed on 10 June 2018, at 20:11.